A correct image of the organs of inside our body helps do get more accurate treatments for our diseases. By X-Ray technique human started to watch inside the human body. Then in modern medicine world CT and MRI techniques are used to diagnosis. In cardiology the three-dimensional transesophageal echocardiography (3DTEE) method is used for crate 3D modal of patients’ heart. The cardiologists of Helen DeVos Children’s Hospital have successfully integrated CT(Computed tomography) and MRI (magnetic resonance imaging) imaging techniques to produce a three-dimensional anatomic model of a patient’s heart. 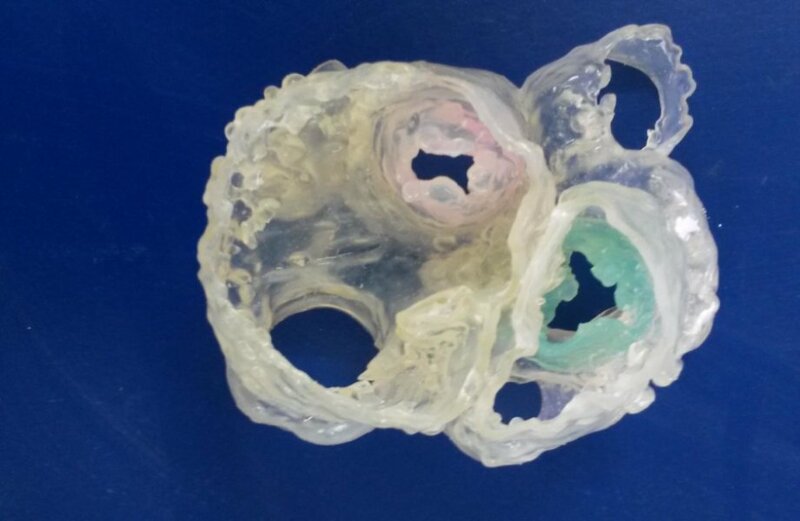 The hree-dimensional transesophageal echocardiography (3DTEE) is used for printing this hybrid 3D model of a patient’s heart. When this 3D heat printing the MRI is superior to other imaging techniques for measuring the interior of the heart, including the right and left ventricles or main chambers of the heart, as well as the heart’s muscular tissue. The CT enhances visualization of the outside anatomy of the heart. The Helen DeVos Children’s Hospital team were used specialized software to register images from the CT and MRI modalities to selectively integrate data sets to produce an accurate anatomic model of the heart. In future this more detailed and anatomically accurate 3D renderings and printed models of heart will change the cardiology medicine area.